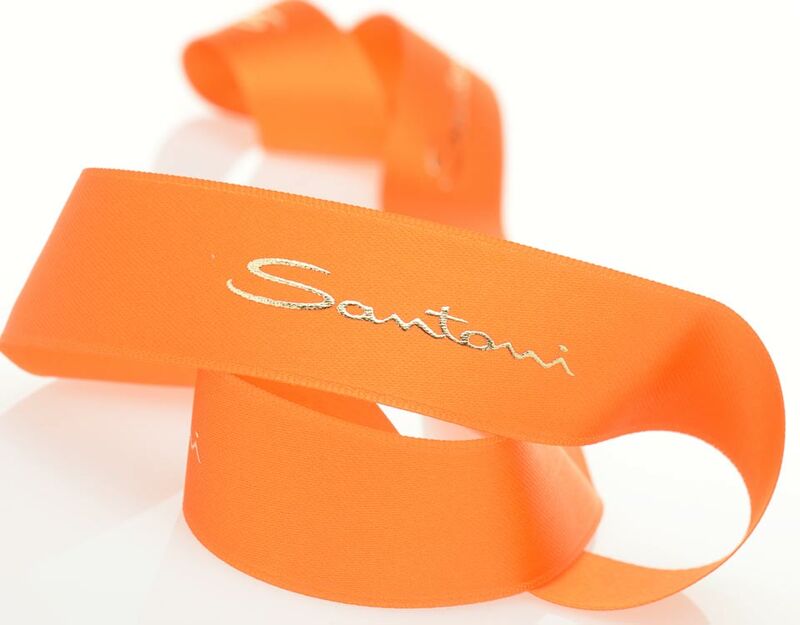 Our personalized ribbons elegantly emphasize the brand image and always stand for quality in the collective imagination—these ribbons exemplify an extraordinary form of attention dedicated to precious objects and to those who receive them. The feeling of delicate organza, refined satin or natural cotton slipping through one’s fingers stirs the most genuine, memorable and inspiring emotions. The creation of personalized ribbons takes place in a crafted process using scrupulous know-how that leads to high quality results. The precise definition of the printing details, the wise choice of materials and the faithful adaptation of the design are absolutely essential to every project, from the ever-classic to the development of original trends and solutions. 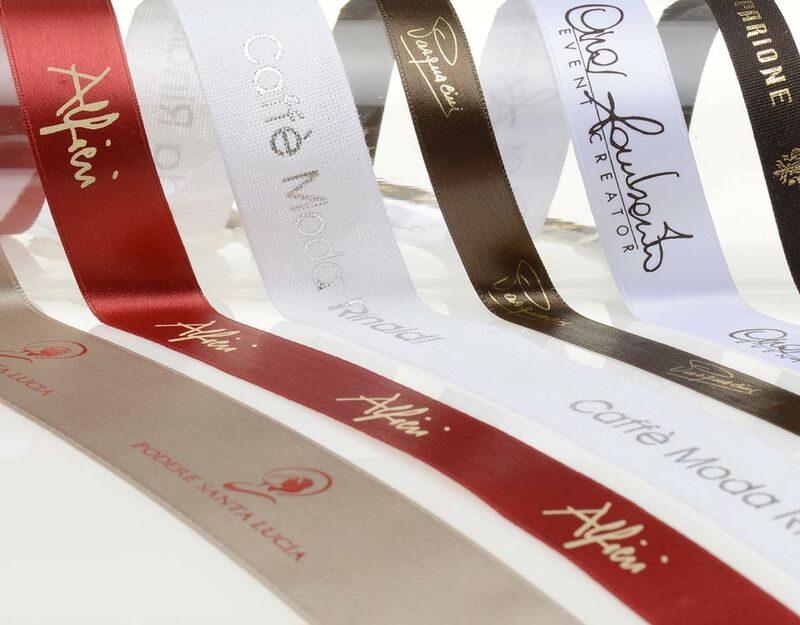 Our personalized ribbon is especially indispensable for highlighting the packaging and may be employed in different creative applications, whether as decoration, or as part of the gift package, or in the preparation, or as a structural element for the shopping bag, the box, the gift bag or the brochure. Hot print, which uses a cliché pressed to the fabric, faithfully transfers color to the hardiest fabrics like satin or cotton. This technique is recommended for printing monochromatic logos. With hot print, colors retain their shine and thus printing in gold, silver or copper is possible to lend even more stunning effects to the package. Silkscreen printing uses artisanal methods almost exclusively and is most like a true art given its ancient origins and the top skills required of the printer. The creation of a stencil of the chosen design is the first application toward the creation of a ribbon with a relief, also achieved with a foil in gold, silver, copper or platinum. 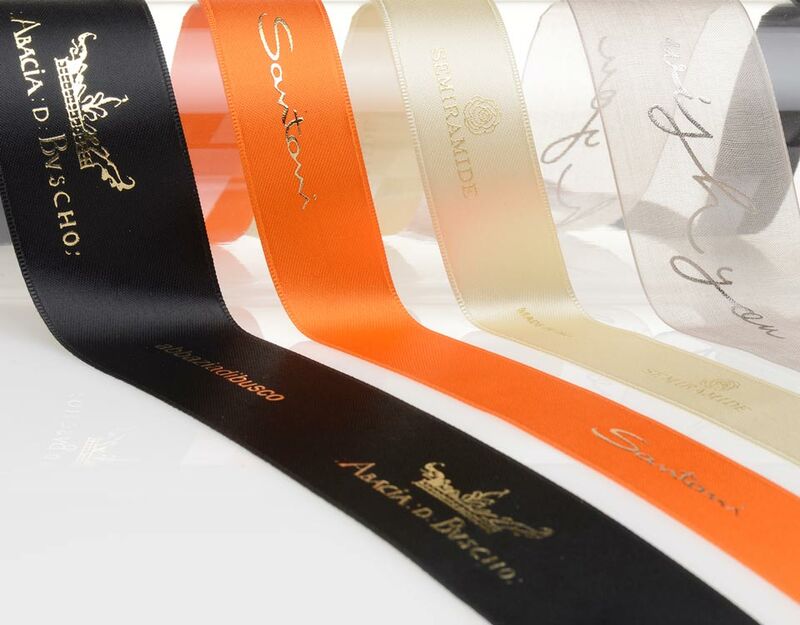 Ribbons with silkscreen relief effects are the most refined and ideal for the most elegant and luxurious packaging. 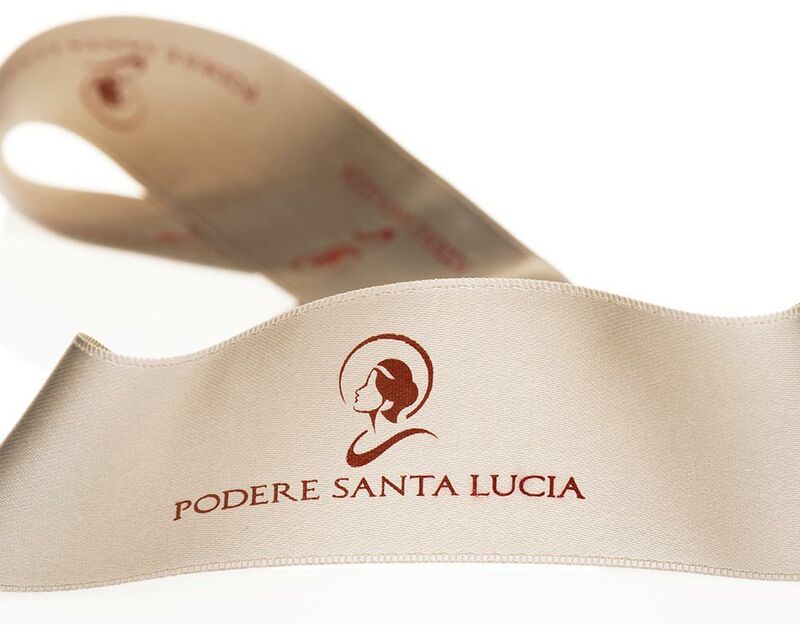 Silk-screening can also be applied on ribbons that are personalized using the Infinity technique. 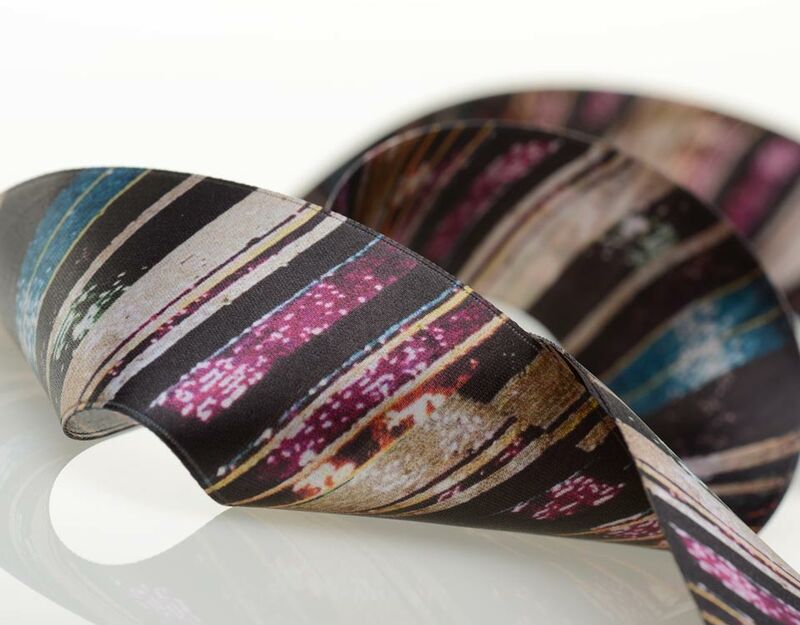 Eco-sustainable fabric prints, developed for the high fashion world, now meet the world of packaging for the first time, affording ribbon detail that was potentially unknown to date. 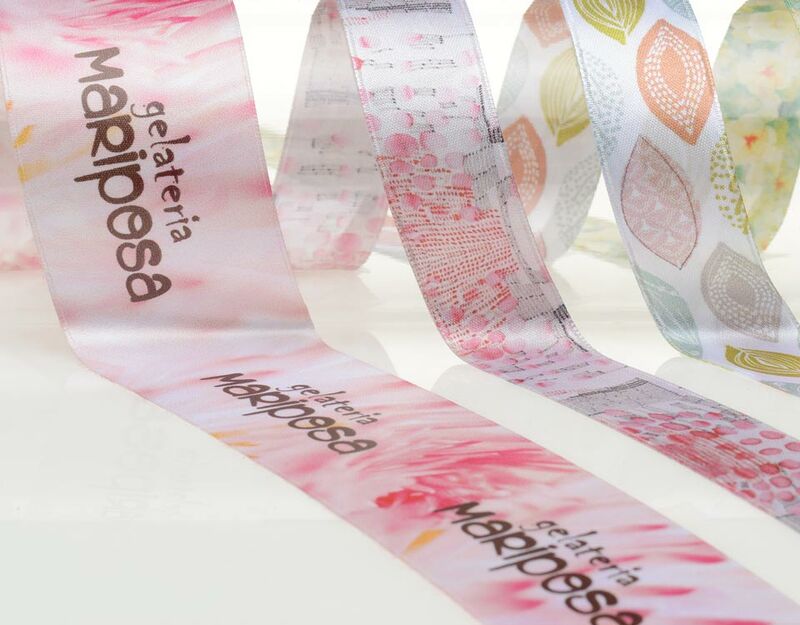 With this innovation, Le Stampe di Alice brings a revolution to the field of personalized ribbons. Infinity means that any design can be transferred to satin, cotton, synthetic fabric, organza o gros-grain, starting from a neutral base to create texture or print logos, designs, and even photographs. Every detail bonds to the theme of the ribbon like a tint or color bath without emissions or discards harmful to the environment. Double Sided Satin: double satin is the most widely used material for personalized printing, a smooth and soft weave pleasing to the touch which captures light in all its nuances. It is versatile and elegant, and offers excellent results for all printing techniques, making it the ideal complement for the luxury shopping bag. Cotton: Cotton ribbon lends itself to a natural look, always popular even in high fashion. Cotton is especially indicated for hot printing and silk-screening; it blends perfectly with canvas, recycled paper and Havana kraft. For ecological projects, organic cotton, GOTS certified, is also available. Synthetic fabric: a valid alternative to natural cotton. Synthetic cotton polyester is light and soft but holds its original look. Thanks to its special resilience, printed results are excellent using any technique. Organza: A much-requested material, organza is a subtle, transparent fabric of very delicate consistency. Infinity and silk-screening are the most suitable techniques for personalizing organza ribbon on elegant packaging using the most sophisticated decorations. Gros Grain Lux: : gros grain lux ribbon is a variation on gros grain embellished with shiny thread, and is noted for its finishing of subtle lines in relief which vividly accent color. Given the irregular surface of the ribbon, the gros-grain is particularly advisable for Infinity and silkscreen printing.